The USB-C MST PD Dock is designed for extra connectivity demands. With the USB-C dock, you can extend the connection of a computer to more USB peripherals, Ethernet network, the speaker and the microphone via USB-C interface. Feel free to plug in upside down for USB-C plug is reversible. 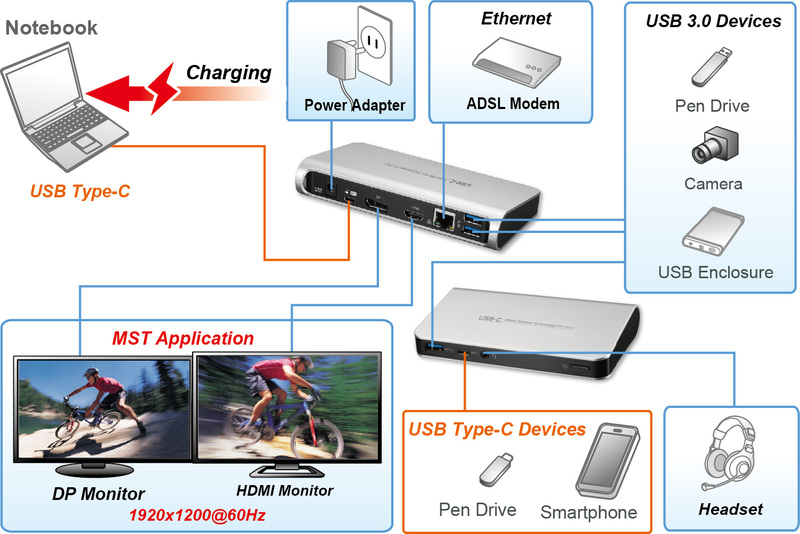 Adopting PD Charging technology, upstream charging function through USB-C interface, you can charge the connected laptop. With the built-in USB 3.0 ports, the dock enables you to enjoy the super speed data transmission between USB peripherals. With the DP or HDMI ports, you can mirror your primary screen, or extend the content. When the system supports MST mode, you can display identical or different content on the external monitors as you wish. Enhanced expansion capability plus the stylish appearance, this dock with video is the most versatile accessory that also complements your home or office space.